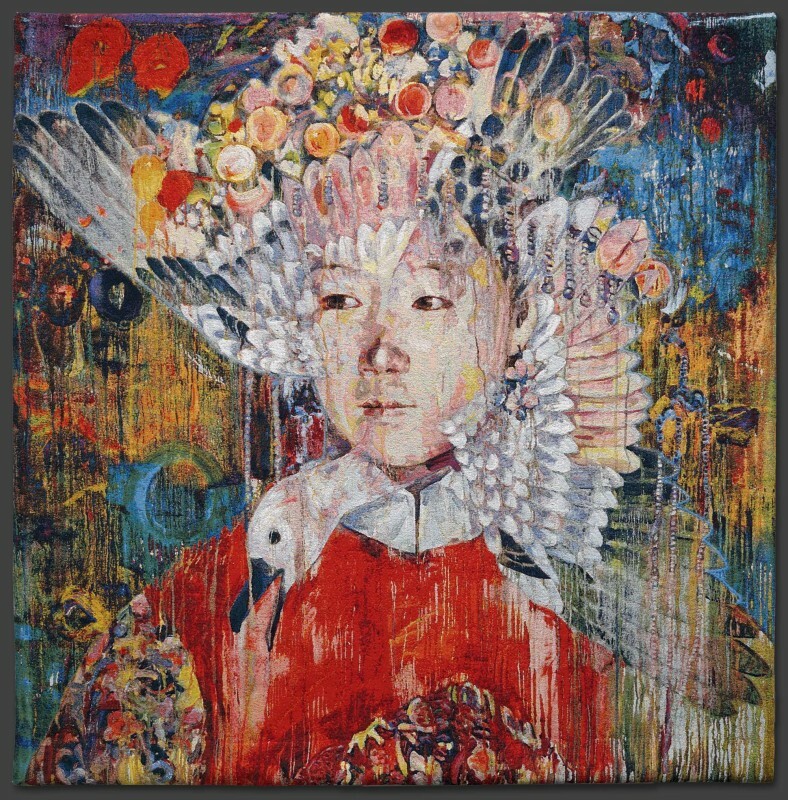 Hung Liu’s 2013 tapestry edition September depicts a Manchurian bride in formal marriage attire, including an elaborate embroidered headdress which the artist has overlaid with the stylized image of a wild duck. September translates Liu’s kaleidoscopic vision into five hundred colors of woven thread; beneath its eye-catching surface lies a compassionate link, connecting a moment experienced by millions with a single instant in the life of a woman whose story has been lost to history. The tapestry’s composition presents an intoxicating bouquet of symbol and color, combining a figurative, photographic portrait with the cascading rivulets and washes of oil that Liu uses to dissolve the viewer’s sense of photography – and by extension, history – as a complete or trustworthy record. Ultimately, September’s vibrancy is reminiscent of those moments in life – whether tragic or hopeful – when our adrenaline and excitement heighten the senses, making colors brighter and passions stronger. These moments where the beauty all around us is suddenly revealed, blooming like the colors surrounding Liu’s bride, are made both more powerful and more fleeting by the knowledge that afterwards, our lives will never be the same.